From the TED.com YouTube channel: What is it like to raise a child who’s different from you in some fundamental way (like a prodigy, or a differently abled kid, or a criminal)? In this quietly moving talk, writer Andrew Solomon shares what he learned from talking to dozens of parents — asking them: What’s the line between unconditional love and unconditional acceptance? From the TED.com YouTube channel: In 1998, says Monica Lewinsky, “I was Patient Zero of losing a personal reputation on a global scale almost instantaneously.” Today, the kind of online public shaming she went through has become a constant. In a brave talk, she takes a look at our “culture of humiliation,” in which online shame equals dollar signs — and demands a different way. Author Julie Penshorn, MBC, makes peace come alive as a way of life for children through engaging, memorable, rhyming literature and music. 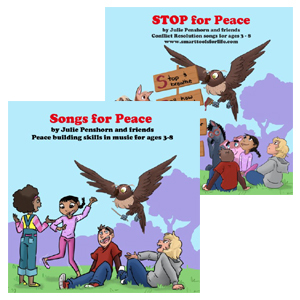 Her books and music work together to build a culture of peace, and are expressly designed for guiding our future leaders when they are children. We are the role models for the next generation and those we mentor are watching us - closely! This short inspirational video will serve as a reminder that our children are looking to us for the answers to how they will lead future generations. What happens when your child has an emotion that is really big and you start to feel overwhelmed by it? First of all, there is nothing wrong with you or your child. So let’s get that clear:) Your child is having an emotion that he needs help with. As you have heard me say many times before - the need that is behind the behavior is the force that is fueling the upset and your child has no way of managing that force. A really great way to help your child through intense feeings is with a trusty pen and paper! I would like to invite you to make use of pen and paper to help your child feel understood, release tough emotions and practice self-regulation. When your child lies, notice your reaction. Are you reacting the way your parents did? Are you instantly triggered by the lie and have a hard time seeing what is really causing it? Please take a breath and step out of your reaction the next time it happens and notice what is triggering you so deeply. Recognize that your child is not lying to purposely betray you for the sake of betraying you. We all know that we can’t parent the way we want to when we are in a bad place emotionally. Even the best and most effective strategies only work when you can bring yourself to the energy and mindset that is going to support you to succeed. If YOU are on the verge of a meltdown, the biggest priority is to take care of you first so you can address what is going on with your child in a way that is not going to create an emotional mess that you and your child will have to clean up. Do you believe these 7 lies about you as a mom? As a mom, have you ever noticed where you make yourself wrong so you can fit into someone else’s idea of what you should do be or have? Have you ever felt guilty because you decided to take on the responsibility of supermom and things didn’t always turn out like you planned and now some things just MUST BE your fault because you are the mom? How many amazing women carry the burden of who they think they need to be and then make themselves wrong unconsciously when they can’t fit into the mental construct that they have built for themselves? What if you could just be? What if you could be free to choose what makes you feel free? What if you could choose from your inner knowing not from what you have been told, taught and feared for as long as you can remember? Feeling like we belong to a “group” is something all human beings need in life, in one form or another. Feeling like a social outcast has powerfully negative outcomes and, believe it or not many are terrified of being socially rejected both consciously and unconsciously. No one wants to be picked last or be the unpopular kid. Life can be very cruel to outcasts. Our desires and expectations for our children to have friends or how they should make friends can be colored by our own fears, feelings and needs around this issue. One of the best ways to understand your core beliefs around friendships is to really pay attention to how you react to the situations that your child experiences in life as he learns all about friendship.